Elegance meets comfort in the Monroe's stunning design, perfect for both formal entertaining and casual get-togethers. A dramatic entry is flanked a grand formal living room and a spacious den. The Monroe's expansive family room flows into an oversized country kitchen. Capping this fabulous 2,800 sq. 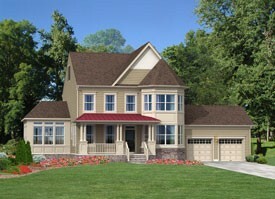 ft. plan, the spacious second level master suite features two walk-in closets and a luxurious 5-piece bathroom.